Over the last couple of years, I’ve been having extended conversations about race, education, visual ideas, U.S. politics, satire, and African American illustrated narratives with groups of young black men at SIUE. We refer to our project as The Interactive Reading Group, a discussion group that utilizes a blog for exchanging ideas. 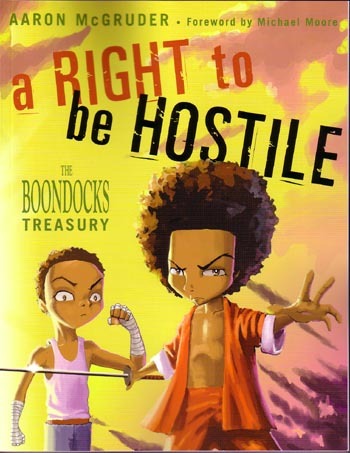 Tomorrow (Thursday), November 19, 2009, from 2:15 p.m. to 3:00 p.m. in Peck Hall Room 3117, we will host a small exhibit that focuses on some of our conversations about Aaron McGruder’s The Boondocks, a comic strip and television show that highlights the experiences of two young black boys, Huey and Riley, who are trying to adjust to living in a white suburb. Taken together, Huey and Riley are comical, outrageous, and in different ways, militant. More and more, we've tried to confront the problems concerning a lack of intellectual opportunities and educational spaces for African Americans at the university beyond the conventional classroom. "The Interactive Reading Group" has been one small yet sustained approach we've taken.